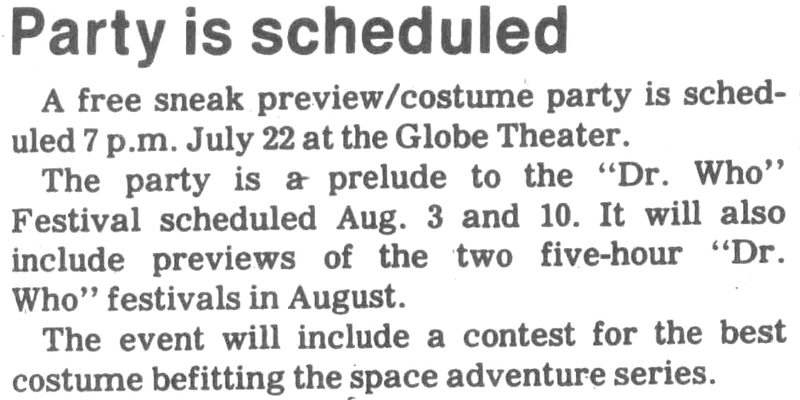 A free sneak preview/costume party is scheduled 7 p.m. July 22 at the Globe Theater. The party is aprelude to the "Dr. Who" Festival scheduled Aug. 3 and 10. It will also include previews of the two five-hour "Dr. Who" festivals in August. The event will include a contest for the best costume befitting the space adventure series. APA 6th ed. : (1987-07-10). Party is scheduled. The Odessa American p. 6A. MLA 7th ed. : "Party is scheduled." The Odessa American [add city] 1987-07-10, 6A. Print. Turabian: "Party is scheduled." The Odessa American, 1987-07-10, section, 6A edition. This page was last modified on 30 March 2019, at 22:10.